Reward your furry feline with these homemade catnip treats. Catnip is a favorite snack for many frisky felines, but some cats have difficulty ingesting this unique grass. Instead of spreading it all over your house, whip up a batch of these simple catnip snacks as a tasty treat for your furry feline. Preheat your oven to 300 degrees Fahrenheit. Many treats are baked at a higher temperature, but these treats bake at a lower temperature to dry them out without burning them. Add 1 cup chicken livers to a small saucepan, and cover with cold water. Heat the pan to simmering over medium heat, and let the livers cook for 20 minutes. Strain off the cooking water, place the livers in a food processor, and blend until the cooked livers form a thick paste. Transfer the paste to a mixing bowl. Stir 1 tablespoon fish oil into the liver paste, and sprinkle in 2 tablespoons dried catnip. Add 1/4 cup flour, and stir to combine. If the dough is still wet and sticks to the spoon, add more flour, a tablespoon at a time, until the dough comes together. Scoop small teaspoons full of dough and drop them onto a cookie sheet. Bake the treats in the preheated oven for 20 minutes. Pull the pan from the oven and test the treats for doneness; they are done when they feel slightly soft to the touch. If the treats feel squishy under your finger, bake them for an additional five minutes. Transfer the treats to a cooling rack, and let them cool for at least an hour. Place the cooled treats in an airtight storage container, and keep them in the refrigerator to maximize freshness. Purchase fish oil from your vet’s office or local pet store. 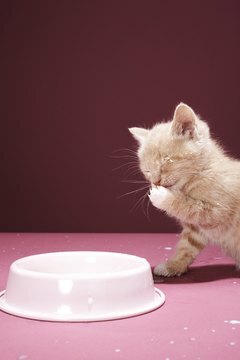 Cats are generally lactose intolerant, so avoid using dairy products when baking for your kitty. Do Cats Get Addicted to Catnip? Why Does Cat Nip Make Cats Crazy? Does Catnip Hurt Cats Long Term? Do Cats Eat Dry Catnip? Does Catnip Dull a Cat's Appetite?